Which is the best version of Minecraft for mods, servers and graphics? We break it down. Which is the best version of Minecraft? That’s not an easy question to answer. For the majority of players the answer is whichever version you’re used to. But what about new players or players looking to jump from a different platform? That’s where things get a little more complicated. Two games, similar features, an ocean of difference. Is the original Java Edition the definitive version? Can Windows 10 Edition’s updated tech slay an unbridled behemoth birthed five years prior? With the help of cutting edge science (read: research and opinion), let’s compare and contrast to see which version is right for you. Both versions of Minecraft support mods. That said, as the Java Edition has been around since 2010, versus the Windows 10 release in 2015, there are a great deal more mods available for the first incarnation. And if I can put my subjective hat on for a second, the quality of the mods for Java are of a higher standard to that of Windows 10. The Windows 10 Edition was, after all, originally designed for mobile, so the modding scene will forever be playing catch up. Java Edition costs a set price of £17.95 in the UK, while Windows 10 Edition sets you back £22.49 on the Windows Store if you’re not familiar with how Google works (both cost about $27 in the US). There is a slight catch, though. Java Edition can be played fully, complete with mods, textures, and everything else you associate with Minecraft, without paying a penny. While you can download variants of all of the above for free in Windows 10, that version also includes optional in-game purchases. These range from map packs, to textures, skins, as well as new game modes. Most will surely turn their nose up at the idea of paying for add-ons in Minecraft, but for parents, as Windows 10’s third-party content has been vetted by Microsoft, it’s a no-risk way of getting more out of the game without needing to worry about bad things happening. Both versions support mouse and keyboard, but only one supports controllers. Despite releasing in 2010, Mojang hasn’t implemented controller support for Java Edition. This won’t be an issue for most PC-centric players, but should you wish to make the jump from the dark recesses of console gaming to PC, you’ll need to install an additional program, like JoyToKey, to get a controller up and running, whereas on Windows 10 Edition, you plug a controller in and it’ll work. Even if you won’t ever use the controller feature, more features beats fewer features in this case. On the Windows 10 version, anyone can team up with players from other devices, including Xbox, Android, iOS, and from June, the Nintendo Switch. When playing with others you’ll need to sign up for a free Xbox LIVE account, but that’s all pretty painless. As this feature isn’t an option for Java Edition, there’s a pretty clear winner. This one’s a nice and easy. Both versions have servers. If you’re new to the world of servers they are, in a nutshell, gargantuan worlds created and hosted online with the intention of supporting masses of players. Think adventure worlds, PvP, puzzle maps, that sort of thing. The only issue here is we’re working with two different versions of the same game, so Java Edition can’t connect to Windows 10 servers and Windows 10 can’t connect to Java Edition servers. When it comes to picking a version, it all comes down to which has more servers you like the sound of. As Java Edition has been around since the dawn of time, it makes sense that’ll have more variety. Plus The Walking Dead server is ace. Java Edition doesn’t have much in the way of parental controls. You can essentially boil it down to: turn chat off, only join servers the parent has checked out first, and general stuff like set real-world screen time limits and enforce it. On the flipside, Windows 10 Edition needs an Xbox LIVE account to play online, which means it comes with all the benefits associated, including the ability to customise privacy settings, alter who your kid can interact with, report dickbag players easily, and so on (you can change your child’s settings via the Xbox site here). 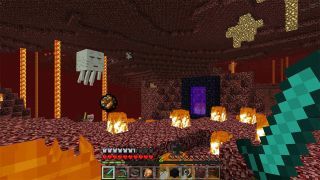 The Java Edition of Minecraft used to be the go-to version when it comes to flashy new content, but that’s since changed as Mojang aims to release updates across both versions simultaneously. On Java you can access the latest and greatest update via the launcher’s snapshot feature, whereas on Windows 10 there’s an ‘Experimental Gameplay’ option that works in a similar vein. If you want to try out the latest new additions, you can’t go wrong with either version. This all comes down to how powerful your PC is. On low-end machines, Java Edition is a muddy nightmare. Render distance is reduced, loading up massive worlds takes longer, and it’s generally more prone to crashes. If you don’t have a rig decent enough to run Minecraft (some people don’t, okay? ), the Windows 10 Edition has been optimised to run on just about anything. But should you wish to really push Minecraft to the limit with realistic textures, exquisite lighting, or actual water physics, then you’ll need to go Java to get the most out of it. That is, until the Super Duper Graphics Pack reaches Windows 10, which boasts a massive graphical overhaul. After that, Windows 10 Edition may just be able to close to gap.